When one of my critique partners was a little girl, her mother would bemoan, “If we aren’t careful, we’ll all end up at the poor farm.” She didn’t know what a poor farm was, but the thought of going there scared her and she hoped she wouldn’t have to go. 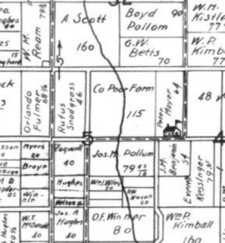 My mother tells the story of being instructed to drive my great-grandfather to the poor farm in Marion County when he ran out of money and my grandfather didn’t have room for him in his house. She said she’ll never forget him looking at her as they drove up and lane and asking, “Why’re you leaving me here?” It nearly broke her heart. Although a lot of people have never heard of “poor farms,” they were once common across the nation. Various terms have been used to describe the “house for the poor,” and often the titles were unique to the part of the country where the house was located. For example, in New England, they were called “almshouses,” in Maryland “county home,” in Indiana “county asylum,” and throughout most of the middle Midwest they were known as “poor farms” or “county farms.” Owned and operated by local government, they provided a place of refuge for those who otherwise would be homeless. The residents were referred to as inmates--a word with a completely different connotation today! In addition to state- or county-run homes, private institutions sometimes operated asylums for the elderly, poor, or orphaned. 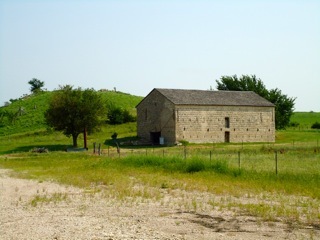 In Kansas, more than a dozen existed, including the Hygiene Home for Friendless Persons (opened in 1890 in Hillsboro), which was financially supported and run by the Mennonite Brethren Church. Many poor farms closed their doors during the years of World War II. The last poor farm in Kansas, the Ingleside Home in Topeka, operated until 1974, closing permanently on March 1 of that year. In June of 2011, two other historical writers and I traveled to the Cottonwood Falls area of Kansas for a little get-away. While driving through the countryside, we came upon a huge rock barn and couldn’t resist stopping to investigate. 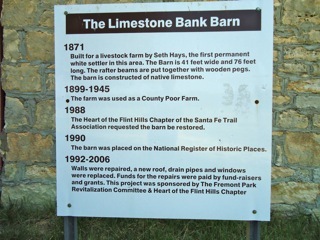 A sign indicated the barn was all that remained of what had once been the county poor farm. Through further exploration at a later time, I learned that the house had been destroyed by a fire in 1945. The information got my writer-thinker going: Who had lived here? What brought them to that place? Where did they go when the house was destroyed? Those questions collided with my previous knowledge of the Mennonite Church sponsoring poor farms in Kansas, and a story seed sprouted into full bloom. On September 17th, What Once Was Lost will find its way to bookstore shelves. Christina Willems was raised by missionary parents who taught her to serve, and she feels very accountable for the residents of the Brambleville Asylum for the Poor where she lives as manager. When a fire breaks out, leaving the house uninhabitable, she faces the difficult task of providing care for those who have come to depend upon her leadership. As Christina’s world crumbles around her, she will learn the true meaning of home and belonging. Reading about the poor farms and learning some of the difficulties that brought people to those places of refuge made me very grateful not only for the home I have here on earth, but for the one waiting for me in heaven. That one will never be destroyed by a fire or flood or close its doors for lack of funding! The mansion waiting for me will be mine for eternity--a comforting thought. Highly acclaimed for her gentle stories of hope, Kim Vogel Sawyer is a bestselling author of thirty titles with more than a million copies of her books in print. 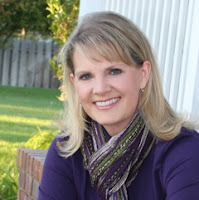 A Kansas girl at heart, Kim enjoys writing stories set on the plains of her home state. She and her retired military husband operate a bed-and-breakfast inn with the help of their four feline companions and relish time with their three adults daughters and ten grandchildren. Learn more about Kim at: www.KimVogelSawyer.com. Ah, Kim. I've written a poor farm story based on Montgomery County Kansas's poor farm. The Independence Genealogy library had a folder full of every mention of the poor farm. :) And GREAT story fodder. And yeah, "inmates" got me in trouble with critiquers and contest judges, had to rewrite it in a way that they'd accept the term. We'll have to chat about it! Funny how things that were so acceptable in previous times are now so unpalatable. :o) The "poor farm" era is such an interesting time in history...I look forward to learning more about your story! Very interesting post! Can't wait to read this story when it comes out! Melissa, what's your story based on a poor farm? I'd love to read it as well. I'd always heard the term "going to the poor house." Wonder if it meant the same thing? Thanks for such a thought-provoking post. I can remember my dad talking about going to the poor farm when I was a kid. I never realized then that it was a real place. My heart aches for your great-grandfather. I can't imagine how hard that was for him and your family. Thanks for sharing this interesting tidbit of history! Like Vickie, I heard my mother and grandmother both talk about the "poor farm" and that's where we'd go if Grandpa's work didn't pick up. I was born at the tail end of the depression and five years before WWII, and we did barely have enough to eke out a living. I had no idea such a place really existed until much later in life and came across an article about them. Thanks for more information about them. You've aroused my curiosity and I'm looking forward to reading your book. Ha! I was just going to say that Melissa has a Kansas Poor Farm story too, and here she's already stopped by and mentioned it. So, here's my story about the poor farm near us (and Melissa). I'm reading and critting her story, and thinking that I'd never before heard of poor farms. Then one day we're driving down the highway into town, and I ask my husband what the big brick building with all the broken out windows is and who owns it. He says "It used to be part of the poor farm." I remember my parents threatening with 'the poor house' as well as 'the poor farm' which I'm sure they got from their parents since they aren't old enough to actually have seen them. When doing research on orphans in Google books I discovered orphans were also call inmates in the 19th century. I love the stone barn! It's beautiful. Imagine what that would cost to build today. Thanks for coming by and sharing today. This is a fascinating topic. Can't wait to read your book. Thank you for sharing the history of poor farms. I have heard the expression used, but didn't know the full meaning behind those words. 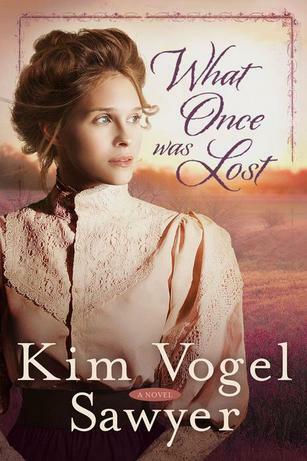 I look forward to reading WHAT ONCE WAS LOST. Oh my, I had forgotten that lament so common in Arkansas. By the third grade, I knew that was a horrible thing to have happen to a family. When we moved to New Mexico the next year, no one said why we were moving. All during the train ride, I envisioned us going to the poor house, as it was called in Piggott, Arkansas. Thankfully, my dad had a job with Atlantic Richfield Oil Company in Lovington, New Mexico — that's why we moved. Thank you for your post. I hope to see more from you. Thanks for bringing to light what many of us only heard as a cliche. Interesting that there were really poor farms. Looking forward to reading your book. I'm guessing that poor farms were basically what is referred to as "the workhouse" in the Regency stories I love to read. I thing the closest thing we have to them now is homeless shelters and those run by the Salvation Army. I'm so glad I've never experienced living in one though I do remember spending a week in a Salvation Army shelter as a child with my parents. Because men and women slept in separate areas we only saw my stepfather at breakfast and dinner as he spent the day looking for work, thankfully after that short time we moved in with my maternal grandparents until we were back on our feet somewhat. Kim, what an interesting topic! Thanks for expanding my knowledge on poor farms--I'd always heard it used as a threat , but never knew much about them. Congratulations on your new book. Our county museum back home in Illinois, where I grew up, was formerly the county poor house. I gave museum tours and we always talked about the poor house as part of the tour. What a sad place to have to live! I've come across "inmates" in the census while doing genealogy and always wondered about that. Now I know--makes more sense. So interesting, Kim! Have always heard the comments re: going to the "poor house" - never knew they were actual places. I enjoy - so much - viewing your beautiful pictures of nature, historical sites, & your adorable grandchildren. I also love B&B's & hope to have the chance to visit yours when I come to visit my son & family (who live in Overland Park, Kansas). Is it open year round? Love the storyline of your book & would love to read it! Hi Kim. Interesting subject except for the poor folks who had to go there. We were pretty poor when I was a kid, back in the late 30s, but always managed to get by with GOD's help. I remember the folks talking about "the poor house" on occasions. As far as I know no-one I knew personally had to go live there. Other kin would always make room someway. But, I do remember that statement, (if we don't get work soon, might end up in the poor house.) As a kid, it didn't worry me. I hate that younger generations have taken words and completely changed the meaning. It is still hard for me to not use gay in a description. Gay used to be a happy word. And, Coke used to be a soda not a drug. Know what I mean? I'm not sure where the nearest poor house was where we lived. Just discovered your blog thru Vannetta Chapman. Really enjoyed the discussion. Growing up as the middle child of pre-Depression babies, I heard about the poor farm, and knew they existed. Glad they were there to catch the people.